Capt. Barry Gibson has been charter fishing and guiding out of Boothbay Harbor since 1971, when he bought his first passenger boat, the Sasanoa. Since then he has owned a succession of boats all named Shark, a tribute to Joe Russell, a Key West charter captain who guided Ernest Hemingway (and whose boat was named Shark) that Barry fished with in 1967. Barry spent much of his chartering career catching groundfish, sharks, and giant bluefin tuna offshore, and built a cutting-edge, 36-foot Downeast sportfisherman, the Shark IV, in 1993. He sold it in 1995 and bought a 24-foot Boston Whaler named Shark Five, which he replaced with the 28-foot Shark Six in 2008. He enthusiastically chases striped bass, bluefish, and bluefin tuna in Maine’s beautiful Sheepscot/Kennebc River systems and the adjacent bays and offshore waters from June through mid-October. Along with chartering, Barry spent 27 years with Salt Water Sportsman magazine, supervising 25 home staffers, art directors, and field editors, and working closely with nearly 100 contributors. Responsible for the editorial content and direction of SWS for 23 of those years as Editor (1981-2004), he also contributed hundreds of feature articles, photos and editorials to the magazine during his tenure. A long-time proponent of responsible fishery management, he has served on numerous state, federal, and international boards, including the New England Fishery Management Council (three 3-year terms, Chairman 1992), the International Commission for the Conservation of Atlantic Tunas (ICCAT) Advisory Committee, and the Stellwagen Bank National Marine Sanctuary Advisory Council. Currently he serves as Vice-Chair of the NEFMC Recreational Advisory Panel, Vice-President of the Northeast Charterboat Captains Association (which he co-founded in 1988) and is the New England Regional Director for the nationally-acclaimed Recreational Fishing Alliance. Barry has fished in major venues, big-game and inshore in North, Central, and South America for over 35 years, is a fomer IGFA World Record holder for bigeye tuna on a fly rod, and has contributed features to many outdoor magazines including Outdoor Life, Field & Stream, Yachting, MotorBoating, Offshore, Tide, New England Fisherman, Striped Bass Magazine, Fishing Facts, Striper, Soundings, Sports Illustrated, and.most recently, Angler's Journal (three of his AJ articles have won international writing awards) and New England Fishing, which debuted in 2016.. He has served as Editor of Center Console Angler magazine as well as Associate Publisher of Fish Boats Registry, and has been the Saltwater Columnist for Maine Sportsman since 1985. Barry has appeared as Guest Pro on numerous TV fishing shows including "Fishing New England" (NESN), "Mark Sosin’s Saltwater Journal" (TNN), " On the Hook" (NESN), and "George Poveromo's World of Saltwater Fishing" (NBC Sports). He gives slide shows and talks to various outdoor clubs and groups in the off-season, co-hosts the Salt Water Sportsman Seminar Series' New England seminar each March, serves as an NRA-Certified Pistol Instructor, is a member of the Boothbay Port Committee, is a Registered Maine Guide, and in 2013 was named as one of the top 50 charter captains in the world (see below). In addition Barry maintains an afficionado's collection of rods, reels, lures and fishing photos dating back to the 1930s, and when not on the ocean he can often be found trout fishing up in the Rangely Lake region or at the Boothbay Region Fish & Game Association pond. 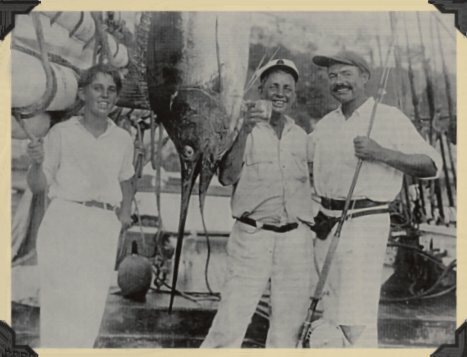 (center) with a blue marlin taken off Bimini in the 1930s. Maine's most experienced saltwater charter captain and Registered Maine Guide -- 45 years in Boothbay Harbor!